The Republic Of Ireland covers 75% of the Island of Ireland and the islets that surround it. The northern part of the island is officially called Northern Irelandand is part of the United Kingdom. The capital of Ireland just happens to be one of the hippest cities in the world. Dublin has become an artistic and cultural Mecca of the last 20 years. The city has now become legendary throughout the world due in part to the literary, theatrical and musical heroes that have emerged from Dublin’s streets. From James Joyce, to Liam Neeson and U2, Dublin is that rare European city that deserves its hype. The Temple Bar area is a lively section in the centre of Dublin. It’s the downtown core area of the city with a large concentration of the coolest bars, cafes, nightclubs, shops, boutiques and hotels. If the old world charm of Dublin isn’t enough, consider the significant presence of the arts, and the energy of youth felt in every cobblestone of the city. Take a day trip out of the city to popular tourist sites such as The Wicklow Mountains and The Boyne Valley to get the full Irish experience. 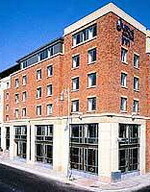 The Best Western Academy Plaza Hotel is located in Dublin, Ireland. The cafes and restaurants of Temple Bar are 500 metres away and Trinity College is 1.5 kilometres away. Set in the city centre, the Hotel occupies a contemporary property spread over seven storeys accessible by lift. The Best Western Academy Plaza offers three dining options on site. Oscar's Restaurant serves local and international dishes in a contemporary setting. Abacus, with its Oriental furnishings, hand-painted pillars, and bamboo bar, offers Asian cuisine, and the informal Sir Harry's Bar and Brasserie with its dramatic chandelier, offers modern British fare. Dublin Castle, located 1.5 kilometres from the hotel, dates for the most part from the 18th century. The former seat of British rule in Ireland, the castle is now open to the public and highlights include St Patrick's Hall, the Throne Room and the Viceregal Apartments. The crypt of the Chapel Royal is now used as an arts centre. 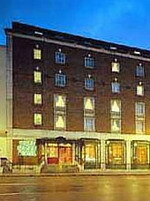 Brooks Hotel is a discrete hotel located within 500 metres of Grafton Street's shops and Dublin Castle in Dublin, Ireland. The nearest coach stop is very close to the hotel, in Suffolk Street, and Dublin International Airport (DUB) is nine-and-a-half kilometres away. Brooks Hotel is a seven- storey red-brick building on a side street. Inside, the lobby has polished wooden floors, armchairs and large windows looking onto the road. A private residents' lounge has a small library, fireplace and bar. There is parking opposite the hotel, with special rates for guests. Francesca's restaurant is decorated in white, burgundy and sage, with wooden floors and potted plants. It offers a selection of seafood specialities. Jasmine Bar has muted colours, leather and moleskin seats, and serves snacks and salads until early evening. The hotel has event catering and conference facilities. Brooks Hotel has its own fitness centre with exercise machines and sauna. 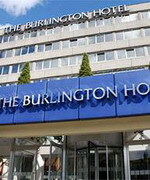 The Burlington Hotel is set in the centre of the city of Dublin, Republic of Ireland. It is located just 800 metres from the shopping of Grafton Street and 1.5 kilometres from Dublin Castle. This 7-storey hotel provides complimentary parking for guests arriving by car. The 24-hour front desk has multilingual staff who can offer concierge services and tour assistance. 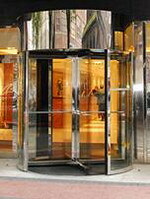 The public areas have wireless Internet access and complimentary newspapers are provided in the lobby. Fitness equipment is also available to help guests keep trim. The Burlington Restaurant offers Irish specialities and international dishes in modern surroundings. The 500 guestrooms have neutral decor, modern furnishings, and coordinated fabrics. All are equipped with televisions, air conditioning, and complimentary high-speed Internet access. Other standard amenities include complimentary newspapers, CD players, and tea and coffee facilities. Complimentary toiletries, bathrobes, and hair dryers are also all provided. 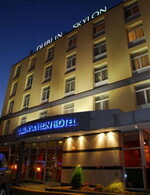 The purpose-built Dublin Skylon Hotel is located in Dublin, Ireland. The hotel is within one kilometre of Croke Park, and three-and-a-half kilometres from Trinity College. The 5-storey Dublin Skylon Hotel is set back from the busy Drumcondra Road, its main gates leading to complimentary parking. The Fayre City Bistro has full-length windows along one side, buttermilk walls and green-and-red upholstered chairs. Breakfast and dinner are on the menu here, as well as Sunday lunch. The split-level sports bar, located off the lobby, has a combination of upholstered couches and leather armchairs, and bar seating. Hot meals and a carvery are served at lunchtime, and bar snacks in the evening. Croke Park, nearby is the traditional home of Gaelic games, is hosting international rugby matches while Lansdowne Road is undergoing extensive redevelopment. 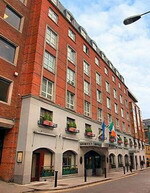 The city centre Jurys Inn Custom House hotel is located in Dublin, Ireland. The purpose-built hotel is next to the International Financial Services Centre (IFSC) and within two kilometres of both Temple Bar and the Point Theatre. Dublin International Airport (DUB) is 16 kilometres from the hotel. A modern hotel, Jurys Inn Custom House is a six-storey, red and white-brick building with onsite parking (surcharge). Arches Restaurant is open for breakfast and offers a snack and a la carte dinner menu. The informal restaurant has light-wood bar, seating, tables and chairs. The Jurys Inn Custom House hotel's 239 climate-controlled guestrooms have neutral decor with patterned fabrics. All rooms have satellite television, dial-up Internet ports, tea/coffee making facilities and complimentary toiletries. 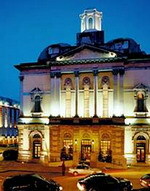 The Jurys Inn Custom House is the closest hotel to the Point Theatre, one of Dublin's major venues for concerts and entertainment. The Georgian Merrion hotel is located in Dublin, Ireland, opposite the Museum of Natural History. The hotel is 500 metres from Trinity College and the National Gallery. 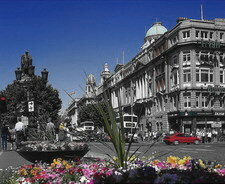 Grafton Street's shops are 800 metres from the hotel. The Merrion hotel occupies 4 Georgian townhouses dating back to 1760. It was converted into a five-star hotel in 1997, when a sympathetically designed garden wing, marble lobby floor and one of Ireland's finest private art collections were added. Restaurant Patrick Gilbaud is the Merrion's gourmet restaurant, with high ceilings, modern paintings and English-speaking French staff. The Cellar Restaurant is a semi-formal dining room with white vaulted ceiling and Irish tapestries. It serves cold buffets, cooked-to- order breakfasts and an a la carte lunch and dinner of Irish dishes. The Cellar Bar, in the original wine cellars, is open all day for drinks, upscale lunch and light meals in the evening. 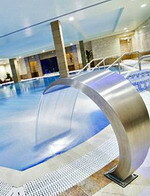 The Merrion's health club has an 18-metre infinity pool, steam room and gym. There are also spa treatments (surcharge) from aromatherapy massages to manicures. The six-story O'Callaghan Alexander boasts a round corner tower within lively Merrion Square in Dublin, Ireland. Less than one kilometre away are the shops of Grafton Street and the National Gallery of Ireland, which houses the Irish national art collection. Carravagio's prepares signature Irish specialties, such as Fresh Mussel Lasagna and Irish salmon topped with a basil crust. Polished wooden furnishings and leather seats fill Winners Bar, which serves an all-day menu, beer and cocktails. Three meeting facilities accommodate up to 400 people. A business center adds convenience. The on-site gym offers cardiovascular equipment and weight machines. Built in 1762 as a Georgian town square, Merrion Square features the seat of the Irish Parliament, Leinster House, the Natural History building and the National Gallery of Ireland. A statue of Oscar Wilde stands here. The author resided at No. 1 Merrion Square from 1855 to 1876. 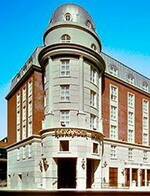 A former church with an original façade dating back to 1863, the O'Callaghan Davenport is located off of famed Merrion Square in Dublin, Ireland. The Pearse Street train station is within 200 metres and Dublin Castle is two kilometres from the hotel. Named after Sir Charles Lanyon, the architect's namesake restaurant features specialties such as grilled Entrecote Steak brushed with Dijon mustard and Pan-fried Veal Medallions. Presidents Bar serves cocktails and casual fare, including fajita stir-fry and warm chicken salad. Saint Ann's Church, 700 metres from the hotel, was built in 1707. The church oversaw the marriages of famed parishioners including Douglas Hyde and Bram Stoker. The O'Callaghan Mont Clare is located in Dublin, Ireland, off of the Georgian town square, Merrion Square, and within 100 meters of Trinity College and 200 meters of Grafton Street shopping. Goldsmith's Restaurant displays a large bay window that looks out onto the street, and serves such specialties as Sautéed Chicken Eire and Beef Medallions with Irish Whisky Cream Sauce. Number One Bar, popular among locals and visitors alike, boasts home-style cooking and plenty of beverages. The popular Hop On/Hop Off city tour buses stop outside Trinity College, and visit 20 of the main city attractions daily. Each ticket is good for 24 hours, allowing guests to join and leave the tour at their convenience. 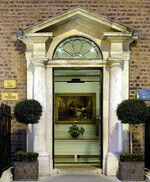 The 18th-century Regency Hotel is located in Dublin, Ireland, within six kilometres of Trinity College and Temple Bar. Dublin International Airport (DUB) is six kilometres away. The family owned and operated Regency Hotel occupies a four-storey former stately home, with a large hall containing paintings, period- style furniture, and a mahogany staircase. The Hotel's Shanard restaurant serves traditional food as well as Asian and Mediterranean-influenced dishes. JJ's All American Bar and Grill offers American cuisine in a family friendly atmosphere. The Appian bar has a traditional pub atmosphere; televised sports; music on Thursday, Friday, and Saturday evenings; and a range of bar food and drinks. The Regency Hotel's multilingual staff can provide information about tours that leave from the hotel, including to the Wicklow Hills and sixth- century Glendalough monastery. A leisure centre provides complimentary use of the pools, steam rooms, fitness equipment, and spa tubs. 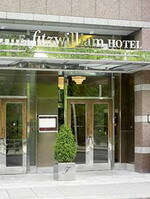 The Fitzwilliam hotel in Dublin, Ireland, is 180 meters from the shopping on Grafton Street. Many of Dublin's landmarks are less than one kilometer from the hotel including Christ Church Cathedral, Dublin Castle, City Hall, National Gallery and Trinity College. Abbey Theatre, Guinness Store House and the Dublin Writers Museum are less than two kilometers away. The lobby in The Fitzwilliam hotel features black-and-white photographs that depict Dublin life, past and present. Complimentary newspapers are available in the lobby. Thornton's restaurant features a floor-to-ceiling wine rack and serves French cuisine, including suckling pig. Mediterranean cuisine is served in the Citron restaurant. The Inn on the Green is open for lunches and evening snacks and serves cocktails and Irish whiskeys. Temple Bar area was originally developed as Dublin's cultural quarter and retains part of this spirit in the form of street performers, drummers, and many intimate small music venues.